The new God Of War bears all the hallmarks of a series reboot. There’s no number at the end of its title. It’s retained the series’ main character but changed the time, place, and tone completely, trading out the edgy ’90s-comic-book look and feel of the Grecian originals for the gray, grim retreats of Norse myth. It’s even overhauled the series’ mechanical foundations, slowing its furious button-mashing combat to a tense, deliberate pace and taking a camera that was formerly perched high above the game’s blood-soaked arenas and sticking it right behind the player’s shoulder. 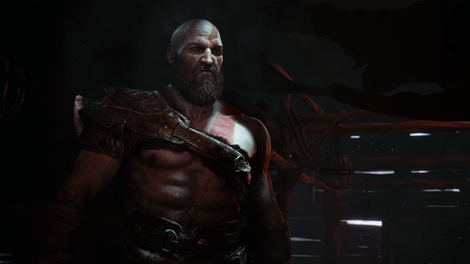 Other than the bulky silhouette and ashen skin of its star—a permanently scowling demigod named Kratos—there’s not much here that resembles the old God Of War, at least not at first glance. But the new God Of War is not another gritty reboot of an aging cartoonish hit. It’s a transformative, introspective sequel, taking up the Herculean task of shunting a series that, for as thrilling as its spectacle was, epitomized an embarrassing adolescent phase of games into something resembling actual maturity. Part of that is baked into the premise, which takes Kratos and has him settle down as a family man in Scandinavia after centuries of wandering, soul searching, and letting go of the rage and selfishness that drove him to murder countless people, decimate the Greek pantheon, and basically destroy all of Greece. The more meaningful sign of growth, though, is how willing the game is to confront the troubling legacy of its predecessors. 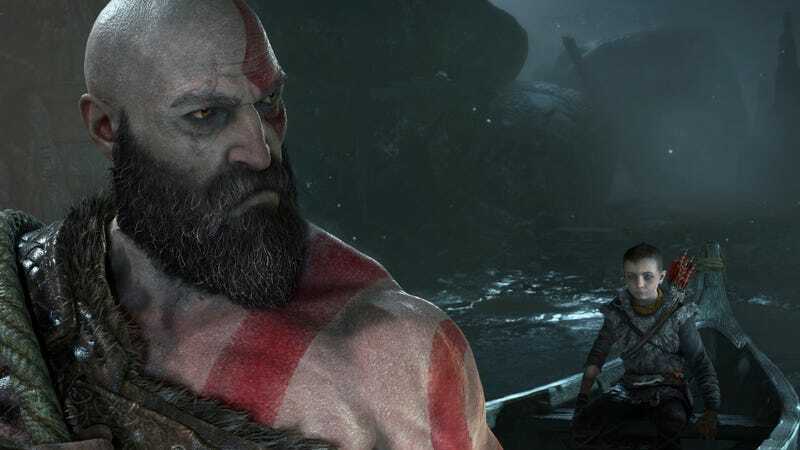 It constantly wrestles with the history of its leading man and the concept of legacy itself, never minimizing or excusing the unimaginable suffering Kratos has wrought. Instead, his past looms over the game like the sinister mark of shame it is, threatening to come erupting out in moments of exertion or disappointment and being used to subtly generate all sorts of dread. Worse, we know the same destructive rage could be bubbling in his young son, Atreus, which makes it utterly heartbreaking every time he loses control and starts hacking away at a dead monster or snaps at a friend who did nothing wrong. We’ve seen the horrible fate he could be drifting toward, and Kratos, having lived it, wants nothing more than to make sure it doesn’t befall his son as well. As far as we know, that’s been a pretty achievable goal up to this point. Atreus has lived a secluded childhood in the woods with Kratos and his mother, Fae, not knowing his father’s past or the godhood that lies inside both of them. After Fae dies from some unexplained illness, father and son set out to honor her final wish of having her ashes spread from atop the tallest mountain in all the realms of this Norse fantasy land. The journey ends up being a long and winding one, complicated by violent interference from a few members of Odin’s family who claim to know the truth about Kratos. Part mythological odyssey, part The Road, the heart of the adventure ends up being the slow, quiet strengthening of the relationship between father and son across the game’s 30-some-odd hours, told through decreasingly hesitant pats on the back and words of encouragement. The growth is woven directly into the game’s rebuilt combat, too. The controller has a button dedicated to calling on Atreus to fire his bow at enemies. The utility is pretty limited at first and it takes a while to even get in the mindset where you’re remembering to use him, but over time and with a few upgrades to his abilities, he becomes an indispensable partner, opening enemies up to attacks, taking it upon himself to work his way into some of Kratos’ maneuvers, and eventually having the capability of doing some serious screen-clearing damage. That progression leads to some of the most charming signs of Kratos’ softening exterior, as the kid, who’s always trying to help and impress his dad, will sometimes use the end of a battle as a chance to ask how he did, and Kratos’ responses slowly change from “sloppy” to “adequate” to, eventually, a heart-melting “you did well” over the dozens of hours you’ll spend watching them bond. And thanks to game’s ambitious camerawork, it really does feel like the player is tagging along for this entire journey. From the moment you choose to start a new game and the main menu transitions into a scene of Kratos chopping down a tree with his magical axe, his new weapon of choice, the camera never cuts away. There are no loading screens as you move from location to location, no cuts to new angles during cutscenes, no fades to black as Kratos passes out and time skips ahead. (There are some fades to white, to be fair, but even then the camera moves into the light in a way that mimics how filmmakers hide cuts to give the appearance of scene being shot in a single take.) You’re with these characters every step of the way, and the result is a much more intimate view and organic unfolding of this father-son-relationship than you’d get from a game with a more disruptive divide between moments of play and moments of idle storytelling. It also leads to a few spectacular fight scenes, the god-powered fisticuffs captured with all the grace and flair of ostentatious long-takes that get film buffs salivating. One drawback of the new camera style is that the game lacks the immediate, awe-inducing sense of scale its predecessors so famously drew upon. In those games, it was common for your vantage point to be pulled way out, revealing Kratos to be a speck charging across the limbs of a living titan. With the camera now often pressed up against Kratos’ back, such moments are rare, but they are effective when they do hit, showing off fantastical landscapes or letting you look out over the long path you’ve carved through the world and cementing how far you’ve come in the most direct, powerful way possible. The other potential hiccup is this new angle’s effect on combat, as it greatly reduces your field of view and makes keeping track of everything around you that much harder. The designers account for this by putting indicators around Kratos that point to off-screen enemies and turn red when an attack is headed his way, giving you a chance to dodge and reorient. This over-the-shoulder sword combat is a pretty unexplored style—strangely enough, the closest comparison is last year’s Hellblade: Senua’s Sacrifice, also a game based on Norse myth—and it takes a few hours of getting used to, but once you’re settled in, those indicators and the accompanying warnings Atreus shouts are enough to keep you informed in all but the most hectic scrambles. Even in those cases, getting hit from off-screen doesn’t usually feel unfair or irritating. Maintaining control and being aware of your surroundings is half the battle. That new demand, plus your vantage point on the action and Kratos’ quickly diminished health, make fights infinitely more tense than they ever were in the older games. This is especially true of the sidequests and secret fights hidden throughout the game’s world. God Of War hasn’t gone full-on Assassin’s Creed-style open world, but once outside the starting area, you get dumped into a lake that houses a bunch of cliff-side beaches and sprawls into several bigger locations. You can explore all of it at your leisure, picking up menial tasks from lonely ghosts (the kid wants to help them; Kratos thinks he’s crazy) and looking for resources you can use to improve your equipment or make new gear. The larger areas, all mines and caves and fortresses carved into mountains, are elaborate mazes of splintering paths, always looping back on themselves to provide shortcuts and branching out into tons of treasure-filled dead ends. There’s also a bit of Metroid-style gating, teasing players with all manner of locks (both literal and figurative) they won’t be able to open until they’ve grabbed some magical ability later in the game. Behind those doors and hidden inside portals around the world are the game’s most difficult fights, intense tests of pattern-recognition, patience, and timing that show off just how flexible the fighting system and RPG-lite upgrades for Kratos and his equipment can be. None of it is necessary for finishing the game, but it’s easily the most satisfying action God Of War has to offer. That’s not to say the combat along the main path is a drag. There’s pleasure in the tension of it, in the heft of every hit and the devastation you can rain down when Kratos and Atreus are in sync, but it was never the main thing pulling me along. That credit goes to the writing, which ably juggles the tasks of bringing us into this father-son relationship, giving both Kratos and Atreus their own personal arcs, and establishing the setting without collapsing into eye-glazing fantasy rambling. It’s worth noting, however, that the script lets down the game’s only major female character, who spends much of her screen time sounding like an overwrought, lore-spewing robot. It’s undoubtedly an improvement over the past games’ awful depiction of women (frankly, you couldn’t get much worse), but it’s disappointing to see the lone living woman in this story rendered as such a flat character for much of it. The only reason she stands out as a relative letdown is that every other character is written so well. The dynamic between father and son never ceases to be entertaining, for example, with Atreus playing the role of an eloquent, chipper ray of sunshine who’s constantly at adds with his stoic, grunting counterpart. And the game’s capability for subtle, impactful character moments, especially ones that give us windows into the grief underneath Kratos’ steely demeanor, never ceases to shock. The writing even adds some much needed thematic heft to the handful of sidequests you’ll find, which are otherwise an uninspired assembly of “go here, get that” scavenger hunts. The stories they tell and the conversations between Kratos and Atreus they prompt all carry morals relating to the life Kratos used to live and is fighting to make sure his son doesn’t replicate. That fight means staring down everything he was and always will be—an unequivocal, unforgivable monster—and doing the one thing he’s always been afraid to do: take some damn responsibility for his own actions. The game is unafraid of going on that journey with him, taking a long hard look at the character it brought into this world and asking us not to forgive or even pity him, but to hope that, after finally accepting who he is and what he’s done, he can turn all that regret into something that actually benefits the world. It’s a surprisingly emotional story for one of gaming’s most emotionally stunted characters, told with care and wrapped in a production that’s a flat-out technical marvel, visually spectacular from start to finish and captured with an omnipresent, unflinching camera that makes it look unlike anything we’ve seen before. Its combination of all these disparate parts—the series’ bombastic setpieces; Naughty Dog-like character-focused writing; slower, more high-stakes combat; bits and pieces of the open-world and RPG elements that have infected every major-publisher release—comes together into a shaky but genuine step forward for big-budget games. This is the first time in years it’s felt like one of these unfathomably expensive blockbusters is putting its weight into moving that field in a different direction rather than riffing on one of its standardized formulas, and it’s every bit as jolting as that Hydra fight was 13 years ago.